On 16 April 1913 Her Majesty Queen Wilhelmina of the Netherlands signed Koninklijk Besluit nummer 29 (Royal Decision number 29) that a Luchtvaartafdeling (LVA - Aviation department) was to be founded within the Koninklijke Landmacht (Royal Army) on first of July 1913. Captain H. Walaardt Sacré would be the commander of the LVA, its four pilots and an sergeant-major-administrator. The LVA started with one car and one rented aircraft de Brik, which was an improved Farman biplane design by Marinus van Meel. 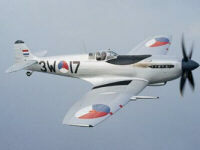 Soon afterwards the aircraft was bought and became the first military owned aircraft in the Netherlands. The LVA was based at Soesterberg near Utrecht, the Vliegkamp Soesterberg airfield consisted of an area of heath as runway and a couple of wooden sheds. When on 14 August 1914 the first World War began consisted the LVA of 10 officers and 31 other personnel. The fleet consisted of nine aircraft, seven Farman biplanes and two Van Meels biplanes. Although the Netherlands was neutral during the war, after mobilisation of the Army the LVA flew many sorties patrolling the country borders. The aircraft production was effected by the war, and two aircraft on order could not be delivered. However a total of 107 forein airplanes were captured after they made emergency landings in the Netherlands. At the end of World War One, the LVA consisted of 110 aircraft and 300 personnel. The department was reduced to a 'peace organisation' heavily reduced in number and limited to the reconnaissance mission. However in 1930s the fear of war increased because of Hitler, German re-arming and general restless feel in Europe. The government dediced the rise the defense budget starting in 1935. The LVA fleet of reconnaissance aircraft was soon strengthened by Fokker G-I and D-XXI fighter/escorts, Fokker T-V bombers and the American Douglas DB-8A-3N light bomber/recce airplane. At the start of World War Two on 1 September 1939, only 125 combat-ready aircraft were available to the Netherlands. Although the Netherlands was hoping to remain neutral, it was attack by Germany on 10 mei 1940. Germany deployed about 1000 aircraft of the Luftwaffe and gained air superiority on the first day. The Luftwaffe lost about 350 aircraft, the Netherlands 94. When on 14 May 1940 Germany heavily bombed the major Dutch city of Rotterdam, the Netherlands surrendered. However the fight was not over, like the government and royal family, many Dutch young man succeeded in fleeing to the United Kingdom. In June 1940 the first Dutch squadron was formed, 320 Squadrons Royal Naval Air Service was formed and its fleet consisted of Fokker T-VIIIW, then the Lockheed Hudson, and finally the North American B-25 Mitchell. When the Casteltown based RAF 167 Squadron with several Dutch pilots was transferred to airfield Woodvale near Liverpook, it was renamed 322 (Dutch) Squadron RAF. Equipped with Spitfires, the squadrons was deployed for air defense of the British airspace, especially against V-1 rockets. The squadron also carried out ground attacks supporting allied troops in their advance, following the landings in Normandy. On 26 juli 1944 the Netherlands government based in Londen founded the Directoraat der Nederlandse Luchtstrijdkrachten (DNLSK - Dutch Air Force Command). It consisted of the Militaire Luchtvaart and the ML/KNIL as well as the Marineluchtvaartdienst (MLD - Naval Aviation Serivce). The DNLSK gained command over the Dutch personnel in the RAF and signed agreements with the British Air Ministry for the training, organisation and equipment of the Dutch air forces. After the war a lot of effort was spent to build up the Dutch military. It was not until 1946 that the first airfields were available for use again, and only in 1947 pilot training restarted. On 28 June 1948 the first three Gloster Meteor jet fighters were entered Dutch military service at Twenthe AB. Soon air defense squadron Nr.1 Squadron was formed, later renamed to 323 Squadron. On 28 January 1949 the first eight Meteors flew to Leeuwarden AB when the squadrons moved there. Leeuwarden AB became the first real jet airbase of the Netherlands. On 17 March 1948 the Netherlands, Belgium, Luxembourg, France and the United Kingdom sign the Treaty of Brussels to organise a collective defense in the form of the Western Defense Union, which was succeeded by the West-European Union (WEU). On 4 April 1949 the Netherlands signed the North-Atlantic Treaty, which would form the bases for the NATO. At the end of 1950 NATO top decided that the Netherlands would need to be equipped with tactical air arms. This was realised in 1952 with the creating of the Commando Tactische Luchtstrijdmachten (CTL - Tactical Air Force Command). It was also decided that the training of Dutch pilots would take place in the United States. On 11 March 1953 Her Majesty Queen Juliana signed the Royal decision, which would give the Koninklijk (Royal) title to the air force, the Koninklijke Luchmacht (KLu - Royal Netherlands Air Force) was born. The KLu would be equal and independent armed force aside the Royal Army and Royal Navy. During the Cold War the RNLAF tactical squadrons would operate in the NATO Second Allied Tactical Air Force (2ATAF). The weapon systems of the RNLAF were integrated in the European defense against the forces of the Warchau Pact. Dutch Nike surface-to-air missile were deployed in Germany and Dutch fighters intercepted Tupolev bombers on a few occasions. The RNLAF took part in major exercises with other NATO countries to train skills and cooperation, for example Red Flag at Nellis AFB in Nevada, USA. Because of the increasing densely populated Europe, it was neccessary to conduct low flying training outside Europe. For this, the RNLAF annually deployed a number of fighters to Goose Bay, Canada. Also the Groep Geleide Wapens (GGW - Group Guided Weapons) annually deployed to the NAMFI Range on Crete, Greece to practise its air defense skills using the Nike Hercules and Hawk missile systems. The RNLAF also deployed for operations outside NATO command. In the 1960s the air force deployed to the crises situation around Dutch New-Guinea. 322 Squadrons embarked on the HMS Karel Doorman carrier which took the aircraft to the island of Biak where 322 would be based to provide air defense. Another operation during this period, was the intervention of six F-104 Starfighters from Leeuwarden AB during the train hi-jack at De Punt in 1977. The noise produced by the low passes of the F-104 Starfighters, made the hi-jackers panic. This enabled Royal Navy Marines and police personnel to supprise attack the hi-jackers and end the drama for the hostages. 336 Squadrons deployed to airfield Hato on Curaçao with two Fokker F-27M Maritime Patrol aircraft to assist civil and military surveillance, transport and search and rescue missions. After the fall of the Berlin wall in November 1989 and the subsequent fall of the Soviet Union, the threat of a communist attack dissappeared. The RNLAF was reformed for the many new tasks it would have to perform besides air defense. NATO transformed into an organisation to solve over the world conflicts and assisting the UN. 'Air Power' became an instrument for international politics. 'Out of Area' operations, deployability, flexibility and mobility replaced the static defense strategy. The transport fleet of Fokker F-27 aircraft was modernised by replacing them with modern Fokker 60 military transport and Fokker 50 VIP planes. The tactical range of the RNLAF was greatly improved with the arrival of two C-130H-30 Hercules medium transports. Later in the 1990s the KLu also received two ex-Martinair DC-10 airliner, which were converted to tanker retaining a part of their passenger and cargo carrying capability. The Groep Geleide Wapens (GGW) returned to the Netherlands and was permanently based at De Peel AB in the south-east region of the country. In 1991 the RNLAF deployed the 3rd and 5th GGW with Patriot and Hawk missiles to Turkey to protect Diyarbakir against attack by Iraqi SCUD missiles. 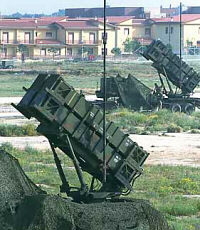 Patriot missiles were also deployed to Israel to defend Jerusalem against SCUD attacks. In 2003 the Patriots were again deployed to Turkey. In 1993 the Dutch army helicopters were now officially part of the RNLAF. The RNLAF would maintain and operate the helicopters is support of army operations. The Tactische Helicopter Groep (THG - Tactical Helicopter Group) was formed and new transport helicopters (Chinook, Cougar) as well as the AH-64 Apache were acquired in the second part of the 1990s. Together with the Lucht Mobiele Brigade (Air Mobile Brigade) of the Royal Army the THG forms the 11 Air Manoeuvre Brigade. 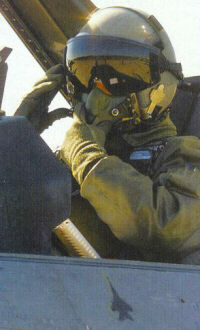 From 12 April 1993 until 20 December 1995 RNLAF F-16s were part of the NATO fleet for operation Deny Flight. Operation Deny Flight enforced the no-fly zone above Bosnia-Herzegovina as imposed by the United Nations. Besides air defense missions, the Dutch F-16 would also take part in missions in the Balkan region delivering close air support to UN troops and aerial reconnaissance missions. Several F-16s also took part in operation Deliberate Force, a NATO-led air campaign in end summer 1995 which resulted in the signing of the Dayton treaties in December 1995. In 1999, the RNLAF participated in operation Allied Force in Kosovo, which was also the operational debut for the upgraded F-16AM. Just a few hours into the operation a Dutch F-16AM from 322 Squadron successfully engaged a Serbian MiG-29 'Fulcrum' with a medium range AIM-120 AMRAAM. Besides the CAP mission, also offensive bombing and photo reconnaissance missions were flown. The KDC-10 tankers refuelled allied fighter over the Adriatic Sea. C-130 Hercules transports flew daily sorties from Eindhoven AB to logistical support the operation. RNLAF aircraft flew 1.194 sorties during operation Allied Force, which is about 7.5% of the total 37.000 sorties flown. RNLAF supported Operation Enduring Freedom in Afghanistan, which was initiated by the United States following the terrorists attacks on the World Trade Center. Six F-16s, one KDC-10 tanker and some 440 personnel were deployed to Manas airport in Kirgyzstan as part of the European Participating Air Force (EPAF) together six Danish and six Norwegian F-16s. Starting 1 October 2002, the deployment was prolonged on 1 April 2003 to 1 October 2003, although the KDC-10 left in March. On several occasions LGBs were dropped in action against Al Qaeda and Taliban forces. In 2003 after the US/UK invasion of Iraq, the RNLAF has deployed four CH-47D Chinook helicopters to support the Dutch marines currently based in the country for security. They will continue to be based here in 2004. In 2004 a Fokker 60 military transport has been deployed to Jordan as requested by the United Nations Humanitarian Air Service. The aircraft will provide the UN World Food Program (WFP) transport capacity flying between Amman in Jordan and the Iraqi cities of Basra, Erbil and Bagdad.